Cleansing body peeling known as “Golden Berries of Kamchatka” is produced by the Russian beauty brand Planeta Organica for its Secrets of Kamchatka series. The product is formulated with ripe sea buckthorn fruit. It gently cleanses your skin from dead epidermal cells, making it noticeably smoother and silkier. The peeling also removes excessive sebum and strengthens skin structure. Principal ingredients. Kamchatka sea buckthorn fruit, Yakut wood sorrel extract, red currant seeds, pine nut oil and cloudberry seed oil are the key ingredients of this cleansing body peeling by Planeta Organica. Kamchatka sea buckthorn contained in the product in the form of pulp and oil is gathered in protected areas of Kamchatka by special permission. Sea buckthorn has been used in medicine and cosmetology for a long time, it is well-known for its powerful healing potential. It contains vitamins and minerals that have a positive effect on the overall condition of your skin. Yakut wood sorrel is notable for its high content of vitamin C that has antioxidant properties. Thanks to it, the peeling helps to improve skin elasticity, strengthens skin structure and prevents premature skin ageing. Red currant seeds have an exfoliating effect. They cleanse your skin from dead epidermal cells gently yet effectively. They also help to normalise sebum secretion, reduce skin pore size, make your skin smooth and silky. Directions. Apply onto wet skin with circular motions. Rinse with water. Effect. Proven results after one use: smoother and silkier skin by 98%; softer and more moisturised skin by 99%; mood boost by 100%. Ingredients. Maris Sal, Glycerin, Butyrospermum Parkii Butter*, Sodium Cocoyl Isethionate, Cetearyl Alcohol, Hippophae Rhamnoides Fruit, Ribes Rubrum Seed, Helianthus Annuus Seed Oil*, Hippophae Rhamnoides Fruit Oil*, Ribes Nigrum Leaf Water*, Abies Sibirica Needle Oil, Schizandra Chinensis Fruit Extract, Oxalis Acetosella Extract, Lycium Barbarum Fruit Extract, Pinus Sibirica Seed Oil, Rubus Chamaemorus Seed Oil, Vitis Vinifera Seed Oil*, Lactic Acid, Glycolic Acid), Parfum, CI 15985. Want to buy Cleansing Body Peeling? Call us or submit your order via our web site! Planeta Organica Secrets of Kamchatka is a cosmetic series produced by the well-known Russian company Planeta Organica. It was launched in late 2014. The series has received a huge amount of positive feedback and managed to become extremely popular in a short amount of time. It is made up of 17 beauty products for hair, face and body care formulated with organic plant extracts and oils. Planeta Organica is a Russian company that specialises in the production of natural and organic cosmetics. Its products are popular both in and outside Russia. The company is known for its eponymous main brand as well as its special series such as Africa, Secrets of Arctica, Dead Sea Naturals, Premium and others. Beauty products by Planeta Organica are made with high-qiality plant ingredients imported from all over the world. 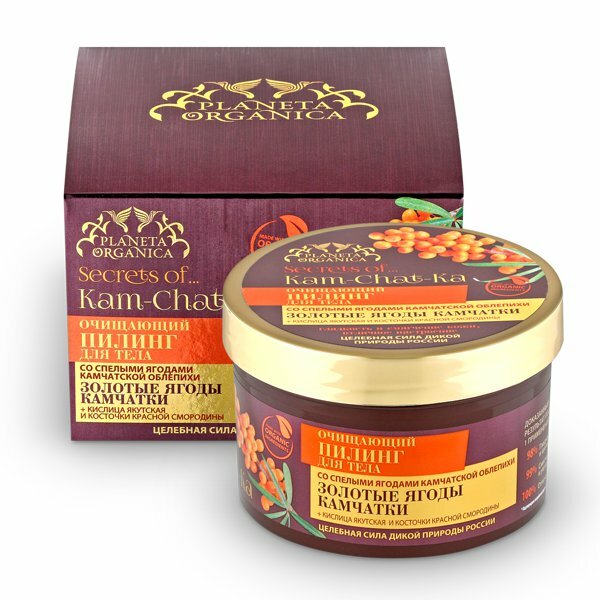 Planeta Organica Secrets of Kamchatka, also known as Planeta Organica Kamchata and Secrets of Kam-Chat-Ka, is one of the company’s most popular series. Its products are formulated with wild herbs and berries, clay, thermal spring mud and sea salt from the Kamchatka Peninsula. In these products, the specialists of Planeta Organica combined the gifts of Kamchatka’s harsh nature and cutting-edge scientific achievements. This combination has resulted in highly effective hair and skin care products for all skin and hair types which can be used both at home and in professional beauty salons.